Virginia Assault Laws are very tough and an assault and battery charge is a serious offense. The basics of all assault and battery charges are the same, but the punishments vary based on different factors such as who the victim is, why they were chosen, and whether there was bodily harm done. Simple assault or assault and battery is prohibited under paragraph (A) as a Class 1 misdemeanor. This is something like your basic punch in the face. Class 1 Misdemeanors are punishable by up to 12 months confinement in jail and a fine of up to $2500.00. If the victim of the assault was chosen because of their “race, religious conviction, color or national origin” there is mandatory term of confinement of six months and mandatory minimum term of actual confinement of 30 days. These are often referred to as hate-crime assaults. Paragraph (B) provides that if there is bodily injury in a hate-crime assault then the assault and battery becomes a Class 6 Felony punishable by up to five years of confinement and a fine of up to $2500.00. The mandatory minimum term imposed must be six months and with actual confinement of up to 30 days. In addition, under paragraph (C) it is also a Class 6 Felony with a minimum six months of confinement to assault: a judge, a police officer, a correctional officer (i.e., prison guard), someone who provides care for prisoners, a firefighter or an emergency medical technician. There are also enhanced penalties for assaulting a full-time school employee or health care providers who are providing emergency services. In plain English, how can one be found guilty of violating Virginia Assault Laws? “Assault” and “assault and battery” are terms that are often used. Their actual legal meaning, under Virginia law, is close to their common every day use. But when someone says “they were assaulted,” they usually mean that they were physically hit. Under the law, the actual physical “hit” is the “battery” part of assault and battery. In Virginia, a “battery” is the “willful or unlawful touching of another” that results in harm. Parish v. Commonwealth, 56 Va.App. 324, 330, 693 S.E.2d 315, 319 (Va.App.2010) (quoting Wood v. Commonwealth, 149 Va. 401, 404, 140 S.E. 114, 115 (1927)). For the purposes of the law, the “harm” does not have to be physical. There doesn’t have to, for example, be a bruise. The hurt feelings that come from being physically hit are enough to make one guilty of a simple battery charge. So one can be guilty of a battery just by touching someone else in an offensive or harmful manner. The “assault” part is a little more complicated. It can occur in two ways. It’s an assault when someone does anything that is meant to inflict bodily harm AND the thing they do has the ability to actually inflict the intended harm. So for example, it’s an assault when someone tries to punch someone else and they’re close enough to actually hit them. It doesn’t matter whether they actually hit. The assault is complete when the person throws their punch. It’s also an assault when someone does anything that is intended to place their victim in fear of being hurt AND the victim actually does become afraid. Clark v. Commonwealth, 279 Va. 636, 641, 691 S.E.2d 786, 789 (2010). What can be done for someone that has been charged with a crime under Virginia Assault Laws? Assault and battery cases are rarely open and shut. 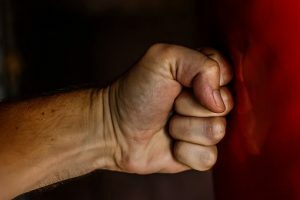 Since an assault and battery must be “intentional” possible legal defenses can revolve around whether any harm was actually meant. In addition, self-defense and defense of others may come into play. If you’re facing an assault and battery charge, you should consider consulting with an attorney immediately to evaluate the facts of your case. Virginia DWI – How will the state prove its case?